He grew up with an adopted older brother, Matthew—who was diagnosed as being on the autism spectrum at age four, the year before Cherry was born—and a younger sister. Although their household was filled with love, daily life was fraught with challenges due to Matthew’s needs. Cherry’s experiences with his brother taught him resilience and determination at an early age. He watched as his brother attended Benedictine School on the Eastern Shore, learning tools to better manage his behavioral issues among his teenage peers. Now 26, Matthew lives in a group home and has a full life. Cars have always been one of Cherry’s passions. At age 13, he started racing motocross dirt bikes despite his parents’ opposition. They eventually agreed to let him race cars. In high school, he considered pursuing automotive engineering in college to combine his love of cars with his aptitude for math. While visiting Charlotte, North Carolina, he shadowed an engineer with a NASCAR team, spent time learning from the engineer at Hendrick Motor Sports, and looked at the Motor Sports Program at University of North Carolina. As he saw the steadfast workers on the engine assembly line, everything clicked—he was determined to drive race cars. He attended Bertil Roos Racing School in Pennsylvania, at age 16. He not only passed the program’s test but also passed his driving instructor on the racetrack. The school’s president urged Cherry to pursue professional racing, introducing him to Eric Langbein, a Formula 1® car racing engineer in Annapolis. Cherry raced at the regional level, setting track records, winning races, and completing five amateur regional races before moving to national races. Cherry placed well his first weekend at a national race in Florida. By his second national race, he had worked with Langbein to fine-tune his car, customizing its mechanics and functions to suit his specific driving needs; he set track records and won both races. As a licensed professional race car driver, Cherry raced for Mazda and Nissan in the Pirelli World Challenge Series, and garnered major sponsors in races televised on NBC and CBS in 2014 and 2015. Eventually Cherry shifted gears, working as a data analyst for a marketing company in Columbia. While he enjoyed the work, sitting in a cubicle was much different than sitting behind the wheel of a race car—he was ready for a change. A family outing celebrating his sister’s birthday guided him towards the next turn on his career path. They went to an escape room in Washington, D.C. and had a fantastic time. Expanding on the model’s concepts, Cherry built the Mission Escape Rooms business himself—it is not franchised. He focused on making the experience more engaging, challenging, and fun. Its doors opened in May 2016. But just a few months after the grand opening, Cherry was diagnosed with cancer when a large mass was found around his heart. He worked 16-hour days, with the help of family and staff members, in between five rounds of chemotherapy treatments and later during radiotherapy. The Submarine Room in Cherry’s Annapolis location — a nod to its seafaring locale –was built entirely in-house. Full of electronics and immersive clues, it maintains an escape difficulty rating of 5/10. 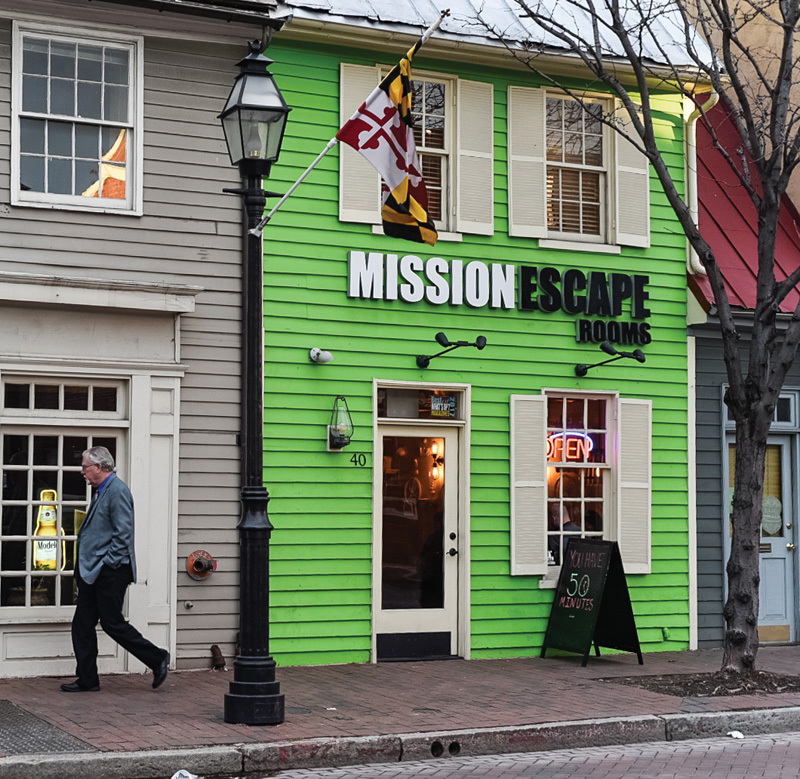 Now in remission, Cherry is planning for a new Mission Escape Rooms at Arundel Mills to open soon. He was recently recognized by the Community Foundation of Anne Arundel County with the 2017 Young Volunteer Award, acknowledging the work of his new nonprofit, Siblings of Autism. His inspiration to start the organization came during his racing days, when he partnered with National Autism Society of America, hosting children on the autism spectrum on race days, and later attending national conferences, hosting sibling seminars, and volunteering on committees. Siblings of Autism’s mission is to supplement the education of those who have siblings with autism. The financial burden that a family takes on while caring for a child on the autism spectrum is substantial, given the need for occupational therapy, one-on-one tutoring sessions, group facilities, medication, and other treatments. Funds are thus typically fewer or unavailable for siblings’ higher education and extracurricular activities. Cherry’s nonprofit provides college scholarships, respite options, and outreach programs. He personally contributes $20,000 each year to the organization, and seven well-deserving siblings are awarded scholarships. A long hallway leading to the escape rooms is decorated with mirrors that Cherry salvaged from a nearby home on Conduit Street, along with mirrors from his parents’ attic. 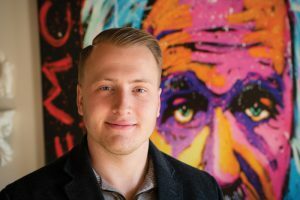 “People often pop into our lobby just to look at the items on our walls,” Cherry says of the DIY painted wall sculptures that surround a pop-art painting of Albert Einstein in his West Street entrance. Error: Error validating access token: Session has expired on Saturday, 09-Mar-19 15:57:50 PST. The current time is Tuesday, 23-Apr-19 01:11:46 PDT.